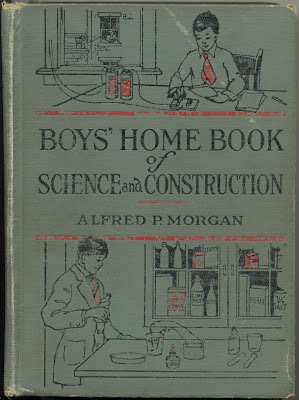 One of the books that got me interested in science as a child was the Boys' Home Book of Science & Construction, by Alfred P. Morgan. It was published in 1921, and a note on the front page shows it was a Christmas gift from Aunt Helen to my grandfather in 1928. This was an old book when I was reading it 35 years ago. Today, a better word for it would be "quaint". Even the cover of this book is amusing. Did boys in 1921 always put on a tie before playing with their homemade telegraph sets, or only when they were having their picture drawn? As I was thumbing through this book today, I realized I was holding in my hands the original Dangerous Book for Boys. Below is a great example. 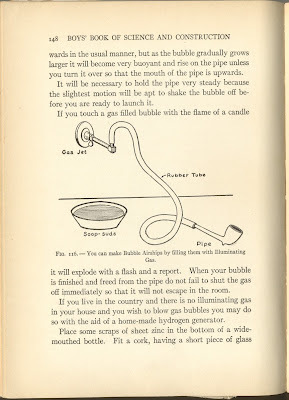 It explains how you can fill soap bubbles with "illuminating gas", and then blow them up "with a flash and a report". My grandfather's house actually had gas jets like the one in the drawing, although by the time I saw them as a child the house had been electrified and the gas jets shut off. And not to worry, you country folk with "no illuminating gas in your house", the next page gives you the recipe for homemade hydrogen gas. This book was written 16 years before the Hindenburg disaster, so they have an excuse for encouraging boys to play with hydrogen bubbles. The story of the company started from the 1980s, in the year of 1984, the replica hublot watches Sabo setup their own watches watches organization with its headquarters in the historical town on Lauf an der Pegnitz in Bavaria – and gave this enterprise his name. A corporation that has been to handle for high-quality silver hermes victoria bags having a unique layout quality from your extremely outset. We always say that it matters not a smidgen what size the replica hublot watches is. What does matter, however, are the aesthetic qualities that always make your ring a joy to observe. Remember, over fake handbags outlet a lady talks about her ring a million times. Ring is a quite significant evidence of true love commitment. At first, i don't very realize why most women love prada replica rings very much, until one day, i saw images of a Tiffany, i was asked almost instantly at the first view of seen it. It's so gorgeous! it's just like the one which i imagined of before. That's amazing design.